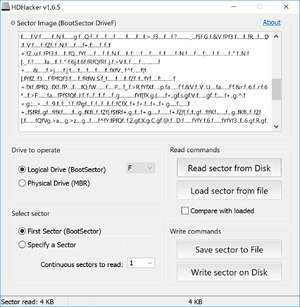 HDHacker is a free, donationware program that was created in order to save and restore the Master Boot Record (MBR) of a hard drive and editing the Boot Sector from a logical drive. It's useful for preparing your system to run other operating systems such as Linux. The interface of HDHacker is pretty easy-to-understand and features the ability to work with any storage media connected to a PC. The functions are organized into two sections: Read commands and write commands. For security reasons, you should also check out the HDHACKER download at LO4D.com which includes virus and malware tests. Additional screenshots of this application download may be available, too.